NTT Inc. - New Year. New Facility. More Training. New Year. New Facility. More Training. It’s a new year and NTT Training is gearing up for a big 2016! 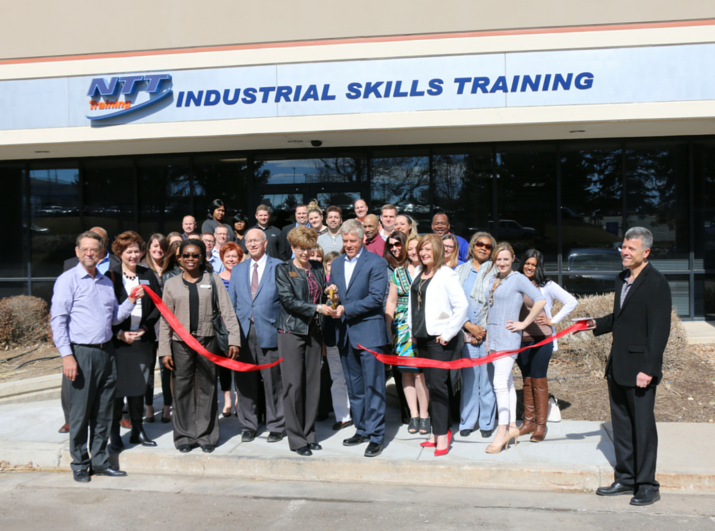 As the leader in hands-on industrial safety and skills training, our organization is growing so much we had to move our headquarters to a new location at 6675 S. Kenton St., Ste 100 in Centennial, Colorado. To make things official we were pleased to host a ceremonial ribbon cutting on Tuesday, March 1, 2016 with Centennial Mayor Cathy Noon in attendance, along with city council members Stephanie Piko and Ken Lucas, Chamber of Commerce President Kevin Hougen, and other local dignitaries. This new, larger location will enable NTT Training to better accommodate increased demand for our services and expand technology and new teaching equipment in a more comfortable and immersive learning environment. NTT Training serves industrial workers and their organizations worldwide by providing the real industrial job skills needed to get work done with improved safety and quality resulting in improved production and less downtime for companies around the world. With a new location NTT Training is energized and excited for what 2016 has in store for our organization and the industries we serve. For more information about or new facility and/or the upcoming training programs we have to offer, please call (855) 712-7353 or CONTACT NTT TRAINING today!